Lapis' modern fusion of stylish Japanese and western design is perfect for group or family stays. Located in a quiet area with mountain and forest views this 3 bedroom property can accommodate up to 8 guests if the traditional tatami room is utilized. Split over 2 floors Lapis is tastefully finished and equipped with modern Japanese features and interiors. Located right on the shuttle route, both the centre of Hirafu village & the ski lifts of Grand Hirafu are a short ride away. To walk into the centre of the village is an easy 10-15 minute stroll. A summer stay lends itself to BBQ-ing on the private deck while enjoying the fabulous Mt Yotei views. 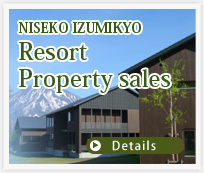 Ideal for family and group Niseko holidays any time of year. Off street parking, air conditioning, high speed internet, all beds semi double.